Lyda Salatian picked up the donated muffins for the first Green Teams event at Campbell Valley Regional Park near Vancouver, but feared that nobody would show up. 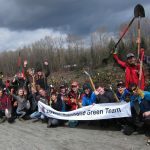 Several years later, thousands of people have driven her fears away by volunteering at hundreds of such events and inspiring the creation of the charity Green Teams of Canada with chapters in the Lower Mainland and Victoria. “People want to get out in nature, but sometimes need a reason for doing so,” says Lyda. People also want to feel like they are contributing, so Green Teams partners with local parks, nature groups, land conservancies, and non-profit farms to do things like remove invasive species, do beach cleanups, and plant vegetables. Mark Bisset had a problem. Each year his organization – the Couchiching Conservancy located near Lake Simcoe, Ontario – put on a big nature festival. It was a major undertaking for a relatively small group of people, needing significant amounts of time and resources. In early years it seemed worth it, but over time attendance shrank. The cost-benefit was no longer worth it. The Conservancy still wanted to get people out on its properties, appreciating nature and engaging with its organization. So, it simplified things, and came up with a great package – a “passport” to nature. 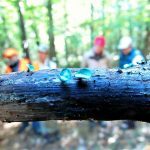 Since its founding in 1987, the Nature Trust of New Brunswick has historically been run through grassroots efforts, with volunteers incorporating the organization to conserve and steward critical natural areas of New Brunswick and to educate New Brunswickers about the importance of these spaces. Prior to 1992, all Nature Trust work, including volunteer coordination, preserve acquisition and communication, was done in private homes and offices until a dedicated office space was found, which brought about growth in both volunteer and staff capacity. 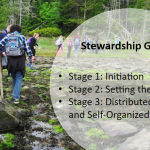 Canadian non-profits and charities active or interested in stewardship of Important Bird and Biodiversity Areas (IBAs) are welcome to inquire about small grants to help them be more effective by improving their public engagement practices.